The two maces consist of base, plinth, buttresses and tracery windows that recall the domed gothic towers in Dutch paintings of the 15th century. The tracery of gilded brass shows vestiges of paint that prove that it was indeed meant to give the impression of a gothic building with its stained glass windows. The mace must be regarded as a sign of rank, a function that it was found to have in the old Egyptian empire and in most of the ancient civilizations of Mesopotamia some millennia before Christ’s birth. 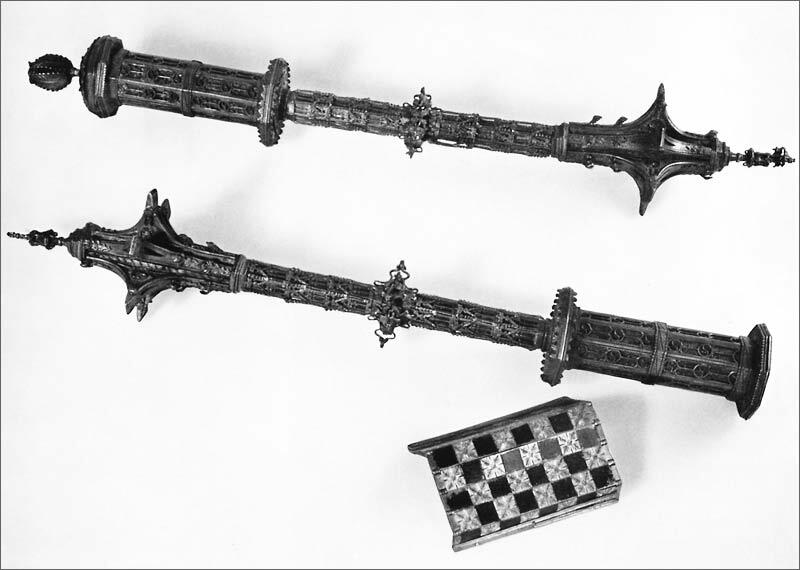 The two Vienna maces are part of the original stock of the Imperial Armory. Whoever cold have used them around 1475, and when was there any demand for such specimens? They must have been made for the battle of Neuss in 1474-75. In order to prevent the power-hungry Charles the Bold, Duke of Burgundy, from taking the besieged city of Neuss north of Cologne, an army moved into the Rhineland led by the Emperor Frederick III and his son, the Archduke of Maximilian, then just sixteen, who was later to become emperor. By the introduction of a variety of amusements, the two noblemen succeeded in leading a very pleasant camp life. Collapsible boards for chess and backgammon fit into the maces’ hollow grips. The lost pieces must have been kept in the hollow shaft. The artist thought up something special for the Emperor, who was extremely interested in astronomy and astrology, in the sun-dial secreted below the detachable cap of the grip. The serious purpose of weapon and badge of rank mingles here the light-hearted character of a fashionable little work of art. Those are breathtaking! Those two maces blur the line between ceremonial object and functional weapon. It truly does make the relationship between scepter and mace very easily understood. WOW! Those are just too much. Thanks for sharing the picts and the info, Nathan. What a cool background for an implement of war. I don't think I could bare to be hit by one of those. Such craftmanship and artwork, I would guess that many of our modern "artists" would be hard pressed to create such a object even with modern devices. Fantastic.